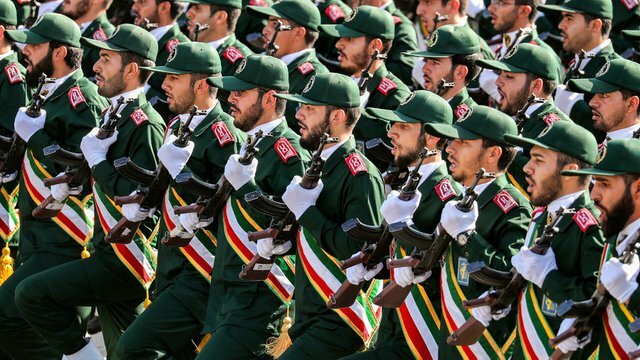 The #US has designated #Iran’s #RevolutionaryGuards as a “terrorist organization,” accusing the elite force of financing and promoting terrorism in the region. Tehran is now eyeing a mirror response for the American military. The move marks the first time the US has ever designated part of another government as a Foreign Terrorist Organization (FTO). Any support or business with the unit will amount to “bankrolling terrorism,” the statement reads further. In a direct response, the Iranian Supreme Security Council branded the US “a terrorist government” and labeled the US Central Command (CENTCOM) and “all its affiliates” as a terrorist group. Speaking after Trump’s announcement, US Secretary of State Mike Pompeo also held a press conference on the matter, explaining that the US designation is set to take effect in one week. Pompeo accused the IRGC of “masquerading” as a legit military force, while “actively engaging” in terrorism for 40 years. The force “organizes and executes terror campaigns around the world” and is working to destabilize the Middle East region, namely Syria, Iraq, Yemen and other countries, according to Pompeo. Notably, while Iran has indeed a limited contingent of "military advisers" in Syria, the troops were deployed there to aid the fight against Islamic State (IS, formerly ISIS) terrorists and on the invitation of Damascus. To the contrary, the presence of American military in Syria was branded illegal by the local government. What’s more, despite ravaging Iraq twice and killing tens of thousands of Iraqis, the US labeled Iran’s “expansionism” as the main danger for the country, as well as accusing IRGC’s “proxies” of killing over 600 US servicemen. Yet, Bolton may have somewhat jumped the gun here. As the Middle East state has been recently suffering from massive flash flooding, it was Washington’s sanctions that prevented foreign aid coming in. The IRGC was formed in 1979, shortly after the Islamic Revolution. The Corps is tasked with protecting the values of the Revolution, along with national security in its broadest meaning. The IRGC has its own land, naval, air, and missile forces. It also has its own special elite-within-elite, the Quds force – an expeditionary branch tasked with operations abroad and unconventional warfare.